Before the 'Green Hell' closes for winter, the Mercedes-AMG GT R has nipped in and set a new Nürburgring Nordschleife lap record. 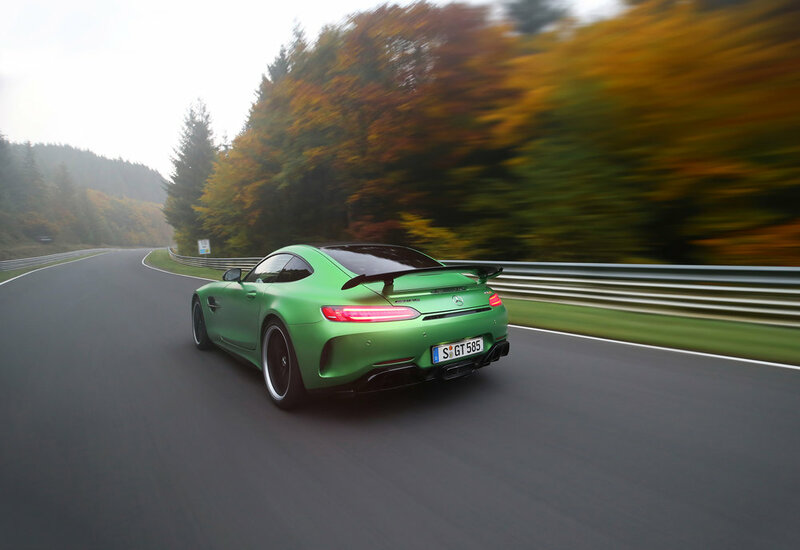 In a test drive conducted by German magazine “sport auto”, and finished in a fitting 'Green Hell' paint work, the AMG GT R set the fastest-ever lap time at the Nürburgring - of 7:10.9 minutes - for a road-going, rear-wheel drive sports car. Mercedes says the AMG GT R spent a large proportion of its development time at the race track, refining the driving dynamics and front mid-engine layout. The 585 hp, V8 biturbo engine (fuel consumption of 24.8 mpg and CO2 emissions of 259 g/km), its ‘extensively modified’ suspension, aerodynamics and active rear-axle steering, were also refined around the famous 20.8km circuit. The Mercedes-AMG GT R is priced from £143,245 OTR.